Yahweh, the Creator of mankind, created mankind for the purpose of giving him Authority over the entire universe. Heaven is thankful that Yahweh is trying mankind first before turning them loose with the Authority to rule the universe. It’s Peace that man must learn. In training mankind for positions in the Kingdom of Yahweh, Yahweh gave to mankind Laws of Righteousness. Those Laws of Righteousness will prevent wars among individuals and nations when taught and practiced. Yahweh shows us this in the prophesied Last Days’ Work of the Kingdom of Yahweh. It’s in this last generation that Prophecy shows Yahweh would establish His House, and in this time period the gates of hell will not prevail against it. Did you notice His House, The House of Yahweh, will actually bring Peace to all nations? The difference in what occurs when this Prophecy is fulfilled and the present religious system is obedience to the Laws of Peace. The present religious system that guides the schools all over the world does not operate by the Inspired Laws of Peace written in your bible. This started with the system fathered by Cush, a system of learning from schools, a system called nimrod, which means he rebelled and also called babel or babylon, meaning confusion. The margins of some marked reference printings of the King James Version say this is the same babylon spoken of in Revelation 17:1, which is right. Revelation 17 shows what is now called the catholic church, the city that sits on seven hills and leads the kings of the earth, even to this day. It needs to be remembered that babylon is the location where civilization began. See Genesis 2:8-14. History shows that troubles, oppression, cruelty, hatred, fighting and wars have never ceased since the days of the creation of the nimrod system. The nimrod system, run by tyrants or violent men, was what the Savior called them after they took The House of Yahweh by violence. The House of Yahweh that King Solomon built was later called the temple by these evil men, after they caused the people to forget the Name of Yahweh. Notice, the description given to them by Yahweh’s Prophet Yeremyah. These violent men, their predecessors and their children, continually used the forceful tactics taught in the educational system called nimrod, which means he rebelled. (Genesis 10) This rebellion, Yahweh has allowed to this present day. Yahweh’s Prophet Daniyl shows when this violent, forceful rulership will end. 20 For since the creation of the world, the invisible things of Him are clearly seen—His Eternal Power and Holiness—being understood by the things that are written; so that they are without excuse. We see in verse 21 that they knew Yahweh. The Apostle was speaking to the children of the fathers brought out of Egypt. They were called elders of Israyl at that time and openly rebelled against Yahweh and Samuyl the Prophet of Yahweh. Here we see the determined and final rebellion in these four religions—pharisees, sadducees, essenes, and herodians. Notice verse 25, speak great words against Yahweh and changed the Laws of Yahweh. These rulers made it a death penalty to practice Righteousness. Yes! See in your own bible. Righteousness is keeping Yahweh’s Laws. The herodians owned an army that stood on their part. This was the roving army, later called the roman army, that captured the established colonies and took them captive to babylon and to Rome in building their empire. Daniyl 11:31…pollute the sanctuary. The pharisees, sadducees, essenes, and herodians made a complete move to Rome around the date 70 CE in order to remove themselves totally from the Righteousness of Yahweh and those who would teach that Righteousness. So they moved to Rome, taking the artifacts of the temple and all of its wealth to Rome. History says, Titus, after the overthrow of Jerusalem, A.D. 70, had the golden candlestick and the golden table of the shew-bread, the silver trumpets, and the book of the law, taken out of the temple and carried in triumph to Rome; and Vespasian judged them in the temple which he had consecrated to the Goddess of Peace. Some plants also of the balm of Jericho are said to have been carried in the procession. At the foot of Mount Palatine there are the ruins of an arch, on which the triumph of Titus for his conquest of the Jews is represented, and on which the several monuments which were carried in the procession are sculptured, and particularly the golden candlestick, the table of the shew-bread and the two silver trumpets. I Samuyl 7 shows us who the Egyptian Goddess of peace is that they continued worshipping after leaving Egypt. Verse 4 shows this Goddess to be Ashtaroth, Astarte, Easter. They are all one-in-the-same queen of heaven, who is also shown by the Prophet of Yahweh, Yeremyah, in Yeremyah Chapters 7 and 44. The event in I Samuyl 7 took place around 1140 BCE, 351 years after the exodus. I Samuyl 8 took place around 1112 BCE, only 28 years after Yahweh’s deliverance shown in I Samuyl 7. The Goddess of peace worship was still taking place in Yeremyah’s days, so Yahweh sent Yeremyah to warn the twelve tribes. 3 Because of the evil that they committed in order to act defiantly against Me—going to burn incense and to serve hinder Gods (elohim) of whom neither they, nor you, nor your fathers knew. 4 However, I have sent all My Servants the Prophets to you, rising early and sending them, saying: Oh, do not do this abominable thing that I hate! 6 So they acted defiantly against Me; and My Justice was poured out and kindled in the cities of Yahdah and in the streets of Yerusalem; and they are a desolate waste, as it is this day. 7 Now therefore, this is what Yahweh, the Father of Israyl, says: Why bring such a great injury on yourselves, by cutting off from the midst of Yahdah, men and women, children and babes, so as to leave no remnant? 8 Why do you act defiantly against Me with the works of your hands, burning incense to hinder Gods (elohim) in the land of Egypt where you have gone to live; so you may cut yourselves off, and be a curse and a reproach among all the nations of the earth? 9 Have you forgotten the wickedness of your fathers, the wickedness of the kings of Yahdah, the wickedness of their wives, your own wickedness, and the wickedness of your wives, which they committed in the land of Yahdah and in the streets of Yerusalem? 10 To this day, none are humble, nor show Reverence; they have not walked in My Laws, nor in My Statutes that I set before you and your fathers. Such a scenario, says the Savior and High Priest Yahshua Messiah, brings a cooling down of love. Now mark this, in this generation nuclear wars. Now back to the Great Prophet of Yahweh, Yeremyah; know them by their fruits. Notice, the evil, violent rulers had forcefully taken control of The House of Yahweh in Yerusalem. But they kept christmas. I have also seen in the prophets of Yerusalem a horrible thing—they commit adultery and walk in lies; they turn from Yahweh and follow after the Gods (elohim)! They also strengthen the hands of evildoers, so that no one turns back from his wickedness. All of them are like Sodom to Me, and her inhabitants are like Gomorrah. They removed Yahweh’s Name from the Inspired Writing of Yahweh’s Prophets. They spread their profaneness, and from the seven hills of Rome, they are still spreading profaneness to all the world’s schools. They do not practice Yahweh’s Laws of Righteousness and Peace. 22 No, it was because Yahweh could no longer bear the evil of your doings, because of the abominations which you committed, that your land has become a desolation, an astonishment, a curse, and without an inhabitant, as it is this day. So who were they still worshipping? The queen of heaven. So the children of Israyl put away the Baals; Lords and Gods (Elohim), and the Ashtaroth; the Goddesses, Astarte and Easter, and worshipped and served Yahweh only. 16 Concerning the word that you have spoken to us in the Name of Yahweh, we will not listen to you! The queen of heaven in verse 17 is otherwise known as the Goddess of peace. VATICAN CITY (CNS) – Before a congregation of more than 100,000 in St. Peter’s Square, Pope Francis formally entrusted the world to Mary. The short ceremony was the culmination of a special Marian Day organized for the Year of Faith. In his homily during the morning’s Mass, Pope Francis celebrated Mary as a model of docility, fidelity and gratitude to God. Remember Yeremyah 44:10, they have not walked in Yahweh’s Laws. These are the same religions, known by their fruits, that were later called pharisees, sadducees, essenes, and herodians when they controlled the temple and its artifacts, that Yahshua Messiah said did not keep the Laws. These religions were not worshipping Yahweh, the Creator, and they hated Yahshua and the Apostles for exposing their sins. Did you notice that? It was they who polluted the temple. So, to where did they relocate after they destroyed the temple around 70 CE? The fact that these elders of Israyl, now called priests of Yerusalem, did not practice the Laws of Righteousness and Peace and the fact that their sins were made known to all Israyl was causing them great trouble in all of their provinces throughout the twelve divisions of Israyl. It was this that caused the secret move and the mystery religion that reigned from the seven hills of Rome to spring up suddenly. The temple of the Goddess of peace in Rome was finished around 75 CE, just in time for Vespasian, the roman military commander, to accept the artifacts of the temple from Jerusalem from his son, Titus, and lodge them in the pagan temple of the Goddess of peace in Rome. Along with these artifacts also came the four religions, shown as four horns, spoken of by Daniyl the Prophet of Yahweh. And a little horn, the herodians who owned the roving army, was used to pluck up the other three religions out of the ten for transport and transplant to Rome. Compare? I considered the horns, and behold, there came up among them another little horn, before whom there were three of the first horns plucked up by the roots; and behold, in this horn were eyes like the eyes of man, and a mouth speaking great things. Notice the little horn who owned the roving army. The herodians did not care for religion but used it to help keep peace as they enlarged the roman empire. These four religions, pharisees, sadducees, essenes, and herodians, with the roving army became the “holy” roman empire and reigned as a religion called the “holy” roman empire, conquering and ruling the whole world, as their historians so proudly proclaim. It was at this time that the pharisees, sadducees, essenes, and herodians took the name catholic, which means universal, because of their wide rule. They have never had peace at any time in their history of armed forces. Rule by force has never brought peace, and will never. It’s much like we see today in Afghanistan and Iraq, the United States supposedly won the war, but the U.S. has never been able to control the people and bring them to peace. People are murdered constantly in both nations. This is also true in the U.S. The government forces, to extreme, trying to “protect” and “assure peace”, but there is no peace. Even with all the force mustered up, peace still evades mankind because of every retaliator, every hater, and every confused mind. 23 Neither shall you have sexual relations wih any animal and defile yourself, along with it; neither shall any woman present herself to have sexual relations with an animal. It is confusion and perversion. When buyers think of tax-payer costs, they mostly think of military expenditure, home land security, and maybe local police and sheriff departments, but there are many other expenses for which the tax-payer carries the burden. In the 1960s all retailers added 15 percent markup to retail items to help cover the cost of shoplifting alone. That did not cover theft by evil lawyers and frivolous law suits that steal funds from hardworking business men. Adding these to the list of force more than doubles all other costs. But it must be added to the list, it’s part of the system and helps to make the system oppressive. Look at all the burdens. Shoplifters and dishonest employees stole more than $6 billion from just 24 major retailers last year, according to a new survey. The survey of 24 large retail companies with a combined 18,518 stores revealed that 1 million shoplifters were apprehended in 2011, up nearly 6 percent from the previous year. It’s not just shoplifters whom retailers have to guard against, it’s also their own staff. On a per company basis, one in every 36 employees was apprehended for theft in 2011. Shoplifting and employee theft will cost the retailer a great deal of lost profits and everyone pays for this crime. Retailers suffer lower profits and consumers ultimately pay higher prices. Some stores charge up to 7 cents per dollar to cover retail losses which can make a business less competitive. Although at times there is a notion that shoplifting and internal theft is a victimless crime, this is in fact not true. Everyone, except the thief pays as it is estimated that every consumer in the US and Canada pay’s a minimum of $250 each year because of crimes against merchants. The cost of shoplifting is high and is expected to skyrocket due to the global economic crisis. Law enforcement in the United States is one of three major components of the criminal justice system of the United States, along with courts and corrections. The 2012 Bureau of Justice Statistics’ Census of State and Local Law Enforcement Agencies (CSLLEA), found there were 17,985 state and local law enforcement agencies employing at least one full-time officer or the equivalent in part-time officers. In 2008, state and local law enforcement agencies employed more than 1.1 million persons on a full-time basis, including about 765,000 sworn personnel (defined as those with general arrest powers). Agencies also employed approximately 100,000 part-time employees, including 44,000 sworn officers. Policing in the United States is conducted by numerous types of agencies at many different levels. Every state has their own nomenclature for agencies, and their powers, responsibilities and funding varies from state to state. Salary varies widely for police officers, with most being among the top third of wage-earners, age 25 or older, nationwide. In May 2008, the overall median was $55,410. The median salary for those at the federal level was $46,620, compared to $57,270 for those at the state level and $52,020 for those employed by local law enforcement agencies. The top 10% earned more than $79,680 and bottom 10% less than $32,070. The following information is from the U.S. Department of Justice, Census of State and Local Law Enforcement Agencies, 2008. Which countries spend most on their military? Now think, even with all of this paid force, and mind you, this is only a fraction of the costs because salaries, from the President on down, are not included in the above information, still nothing and no one are safe or secure in today’s world. Your life or the lives of your family members could be taken at any time or any place, even in your own home. The Apostles were inspired to write about the Savior, Yahshua, Who is High Priest over The House of Yahweh. Therefore, brothers, having boldness to enter the Most Holy Place by the blood of Yahshua. …the gates of hell shall not prevail against it. The gates of hell were allowed to prevail against The House of Yahweh in previous times. Yahshua and His twelve Disciples were murdered, and The House of Yahweh, which they called the temple, was destroyed. All the artifacts were moved to Rome, by Titus, as was the Book of the Law. The House of Yahweh did not exist, nor were the Laws of Yahweh allowed to be taught for almost 2,000 years. The catholic popes made it a death penalty to keep the Seventh Day Sabbath of rest. It was a death penalty to own a Seven Lamp Lampstand, which signifies the seven planned and prophesied Works of Yahweh. But again, the Name Yahweh was caused to be forgotten for the title lord. The House of Yahweh and millions of Yahweh’s followers were put to death for keeping Yahweh’s Laws and using His Name, as Prophecy showed they would be. Not one stone was left on top of another of The House of Yahweh that they called the temple; again, removing the Name of Yahweh. 16 Behold, I send you out like sheep in the midst of wolves; therefore, be as wise as serpents, and as harmless as doves. 17 But beware of men! For they will hand you over to the councils, and scourge you in their synagogues. 18 And you will be brought before governors and kings for My sake, as a testimony against them and all heathen. 19 But when they hand you over, do not worry about what to speak or how you will say it; for it will be given to you in that same hour what you should speak. 20 For it is not you who speaks, but the Spirit of your Father Who speaks through you. 21 And the brother will hand over the brother for death, and the father the child. Children will rise up against their parents and cause them to be put to death. Think: six million in Germany alone! Why? If a family celebrated the Seventh Day Sabbath from Friday sunset until Saturday sunset, they were arrested, the children were taken from the parents, and in most cases, the mother and father were murdered by the municipal system. This is exactly what took place in Germany during the Holocaust; but then, even the children were murdered. The ‘he’ spoken of in Daniyl 7:25, most scholars agree is the roman catholic church and their great army of murderers. There were many other reasons for the death penalty; such as owning a copy of the Writings of the Prophets and/or the Apostles, praying for the sick, anything that showed they were in any way obedient to Yahweh, Yahshua, and/or Yahweh’s Laws. It was a death penalty to print any copies of the Prophets’ or Apostles’ Writings for almost 2,000 years, under the authority of the catholic church. From whom comes authority to the religion that sits on seven hills and reigns over the kings of the earth? For Salvation and a position in the Eternal Kingdom of Yahweh, the Inspired Writings of the Prophets of Yahweh and the Inspired Writings of the twelve Disciples of Yahshua are the only Authority, and that Scriptural fact can never be changed. Read in your own bible. How do we know these Writings are inspired by a Higher Being? The Prophecies came to pass in detail. We have on hand several books dealing with Prophecy. They show the Prophecies that have come to pass and the few that are prophesied to come to pass in this generation, as the Savior Yahshua said. Yahweh allowed mankind to follow the Gods into sin to prove to mankind that sin brings death, as was told to Adam in the beginning. Mankind chose sin, as did their Gods, and they are still following the Gods to this day. I have not spoken in secret, in a dark place of the earth; I did not say to the seed of Yaaqob: Seek Me in vain. I, Yahweh, speak Righteousness! I openly speak things that are right! Are the religious leaders too blind to see and too ignorant to read? Yahshua tells it like it is, like it was and like it will be. Yahweh is offering Peace to the world today, but the religions are leading the nations into wars. Very soon, in this generation, we’ll see nuclear wars. Why are the nations not having peace? Yahweh is asking you why? … because they have transgressed the Laws…the inhabitants of the earth are burned, and few men left. Think! The nuclear burning was prophesied to take place in this present generation. The knowledge to create a nuclear bomb was not available until this generation; yet, the Prophecy was written thousands of years in advance for this generation. The Book of Revelation given to Yahshua Messiah to show to His Servants things which must come to pass in a shortened time, show the lawless beastly system and from whom the system gets its authority. This religious system is described as a beast because a beast has no conscience. It does not worry whether its actions are righteous or not. Its only concern is that it gets what it wants. Notice now, the beast that rises up out of the sea has seven heads. We see that the dragon gives this beast its authority. Authority? And after these things I saw another Malak come down from heaven, having Great Authority; and the earth was enlightened with His Glory. So the authority given is over peoples, multitudes, nations and languages. As the catholic historians so proudly proclaim, they rule the whole world with their armies backing them in forcing their rebellious, lawless ways upon all who dwell upon the earth. That identification is shown in the word sea in Revelation 13:1 and waters in Revelation 17:1, as Revelation 17:15 clearly defines. Seven heads? What could seven heads be? The location of this religion that is supported by the greatest armies of the world is important, and also indisputable because it fits no other city or religion on earth. What are these seven heads? This is the lawlessness we see in all religions throughout all the earth today, because from her profaneness has gone out to all the world, as was foretold by Yahweh’s Prophet Yeremyah. Verse 11 shows lawless priests had taken control of The House of Yahweh that King Solomon had built. They were violent men who took The House of Yahweh by force. From there, the Vatican still rules the kings of the earth. The kings that will not cooperate with the pope are removed and replaced, as we still see taking place. The catholic church is seen here as a woman, leading the kings – world leaders, preachers/priests – of the earth. Her teachings are lawlessness, following the Gods. Satan owns this religion, according to your bible. Through this religion, Satan has deceived the whole world. Satan is the only authority of this religion. There is no place in your bible that shows Satan as being a giver of Eternal Life. You are told to turn from those who deceive. You are also told to repent of sin. There will not be another sacrifice for sin. Yahshua, the High Priest over The House of Yahweh, is offering Salvation at this time, in this generation, to those who will come out of this deception the whole world is following. Where does Yahweh tell you to go? The House of Yahweh was established in these Last Days, this last generation, as foretold by the Prophets. After 2,000 years of fighting, killing, and wars, both the Holy Scriptures, called in Isayah The Book of Yahweh, which is the Inspired Writings of the Prophets and Apostles of Yahweh, and The House of Yahweh have been brought back and made available to the people. This is all in accordance with fulfilled Prophecy, and it took place in this prophesied generation. 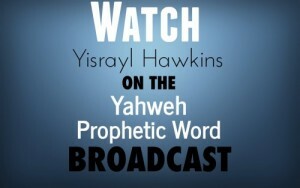 The House of Yahweh is taking the Message of the Kingdom of Yahweh to all nations as Prophecy said it would. The gates of hell will not prevail against this last Work of Yahweh. What would you believe that He would teach? This is the Covenant He is teaching. Nuclear time is at hand. Peace, Protection, and Salvation can only be found at one place. Call, write or email us, but hurry! And then Genesis 10:8. Cush… We have begot, the true translation should be fathered. He fathered. Cush fathered nimrod… That is, he created this institution. This institution, you’ve got to remember now and put it together, but it’s an institution of higher learning. It’s an institution of money. Money, taxes, paying taxes, it’s a scheme that was put together. As this one man, a millionaire or billionaire that has figured this thing out, he said the schools were created to keep you under control, to keep you working for them. And what they’re doing here is to put you in a position where you will make money, pay taxes to the government, to support the huge government and to make it grow. They want a huge government. That was all shown in this institution of nimrod. They wanted to create this in order to take over, where they could put themselves above everyone else. Instead of being like Yahshua, putting Himself under everyone and being a Servant, which brings peace, they want to put themselves up over, bring themselves above. That was shown in this word nimrod. And this group here, that is given somewhat extra knowledge, extra understanding, this group then took over the world and brought this system that we see, called nimrod, brought it throughout the whole world. So they’ve got the whole world seeking money. On the business reports, they are looking at Israel now, the land of Israel, which is also made up of Abraham’s lineage, but that’s not the total of Abraham’s lineage. That’s only a very few. You’re made up of Abraham’s lineage, practically the whole world is made up of Abraham’s lineage. In fact, according to biology, there’s no separate races at all. We’re all the same blood and so forth. But in this one family that He brought forth, they multiplied, multiplied tremendously as Genesis 48 here said, speaking of Ephraim and Menasheh, saying you’re going to become a multitude of nations. The other one will be great, but this other one will become a multitude of nations and take over the earth. Well here now in Genesis 49, we see the Prophecy concerning Simeon and Levi. Genesis 49:5. Simeon and Levi are brothers; their swords are weapons of violence… Their weapons of war, weapons of violence. Get this in your mind. This is going to be. And this is what President Obama, whether he knew it or not, he’s bragging about this right here. He’s bragging about what we have become. Well, what we have become is going to kill us. What we have brought forth here, and this is what Yahweh is showing us here in this chapter, is violence that the world fears, but you can’t control people with fear. You can control people by being servants to them and everyone serving one another. A man would be a fool to step out of such a lovely situation as service to one another and become violent like this, but they can’t see this right now. They can’t see what it’s even coming to. Verse 6, Let me not enter their council… Which means they have council, and if you’ll look this up, it means schools of higher learning. This is where it came from and there’s I don’t know how many hundred Scriptures. I could spend months covering just the Scriptures that this refers to right here, this council, these schools set up throughout the whole world, mentioned by Daniyl as devouring the world. …Let my glory not be joined to their assembly… Which means they have assemblies. Now, this is talking about religion, religion here that these people right here, these two brothers right here, is going to bring forth throughout the world. …for in anger they killed a man… Yes, how many times is this taking place daily now? Even school shootings in anger, they go and kill the teachers and the students until somebody shoots them down or they turn the gun on themselves. …and for their pleasure… With much pleasure. And the example that you see, if you’ve read it yet in Genesis 33, 34, 35, of these two men and what they did to a prince and his family and the tribe. If you could read that and not get sick at your stomach as to what what these two brothers did, and the confederacy that had already been formed, probably in Egypt before they came out, but they used this against their brothers. When they wanted something, they went and took it. So Yahweh, instead of allowing this tribe to grow and take over the earth and just control it with fear and greed and killing, He scattered this among the tribes. And this is what was prophesied right here, that He would scatter them among the tribes. Look at it. Verse 7, Cursed be their anger, so fierce… Yes, you see it, bits and pieces in the genes, but He wants you to see it throughout the world too. …and their fury, so cruel!… He said. And of course, they do this. They display this in the wars, and I’m sad to say that we saw it in Guatanamo Bay. Everybody should have seen that, what was taking place. Anyone who has television sets, it was shown what these men, what their characteristics were that Yahweh says is coming down to you in The End, for the Last Days, as Genesis 49:1 shows. A Prophecy that was given by a Great Prophet here, speaking to the lineage that He said was going to rule the world, possess the earth. He says, …I will scatter them in Yaaqob and disperse them throughout Israyl… Well, in doing this now, they became schoolmasters. These two groups here which multiplied. You’ve got to study this closely and see their allotments and so forth to understand it. But they became the schoolmasters of the lineage of Abraham and then when it came to Daniyl the Prophet, he said, they have devoured or will devour the whole earth. This system here, called worthless, it’s a worthless system, the same thing that christmas is called. Let’s turn over to Isayah 14 now and see this system. Now, remember what we just saw and what I just explained to you and the Prophecy there in Genesis 49 concerning this family and these two tribes and their character, their evil, cruel, ruthless character that are the teachers of America. If you read about the crusades that the popes have brought throughout the earth, you can see Simeon and Levi in them. You can see their character. If you read about the crusades, they were just the same as they did with that prince and his family that wanted to repent. In fact, they were repenting. They wanted to be circumcised. They wanted to be a part of Israyl and the Law says let them do it. “Let them start keeping My Feasts and they won’t be heathen anymore. They’ll be My Children.” And that’s what they were. They were even kinfolks. They were brothers and sisters to them. Well here in Isayah 14 now, let’s start with verse 3. Isayah 14:3. It will come to pass in the day that Yahweh will give you rest from your sorrow, and from your terror… This is what is taking place right now and Yahweh is saying, there’s going to be an end to it. You say when? Well, are you ready? Are you ready spiritually? Have you overcome everything that Yahweh wants you to? He’s waiting on you, you know. We’re not waiting on Him. He’s waiting on you to get ready. Are you ready spiritually? Have you overcome everything that Yahweh wants you to? He’s waiting on you. We’re not waiting on Him. He’s waiting on you to get ready.